I'm notorious for being a ridiculously lazy person, especially when it comes to looking after my hair. I have discussed countless times on here the sad sorry state my hair is in; split ends, frazzled from bleaching, dry and coarse; it's always been in a pretty terrible condition. This is predominantly due to the fact I have a love for being (faux) blonde and cannot resist back-combing my hair. A lot. A simple, quick and easy way for me to give my hair a bit of a pamper is to use an oil. Now, I've tried a lot of different oils, including Lee Stafford and Macadamia, but I've never really had 'WOW' results. Yes, they made my hair feel nice and soft, but I didn't notice a big difference in overall condition, nor did I notice an improvement in the length of my hair. You see, I am on somewhat of a quest for mermaid hair and thus, I NEED to start looking after my hair properly. Enter Moroccanoil. The Holy Grail, the elite, the superstar of the hair oil world, Moroccanoil is a product every oil-addict just has to try. I'd wanted to try it for an absolute lifetime, but really couldn't justify the pricetag, so I kept to my somewhat mediocre drugstore hair oils, whilst hovering over the 'buy' button every now and again, before whimping out. 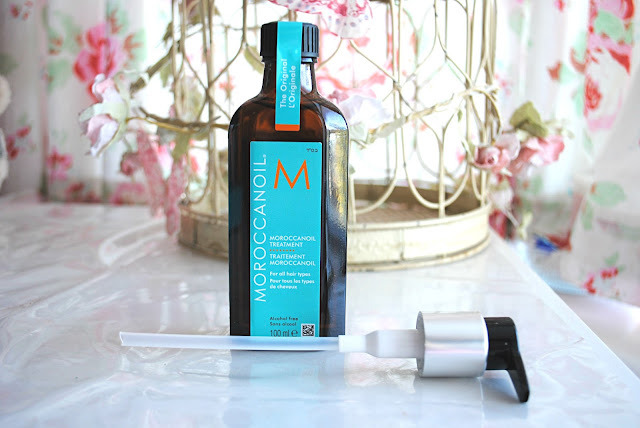 When I was given the opportunity to review Moroccanoil, I couldn't say no. It is, afterall, a product I have lusted after for so long, and I wanted to see what all the fuss was about. 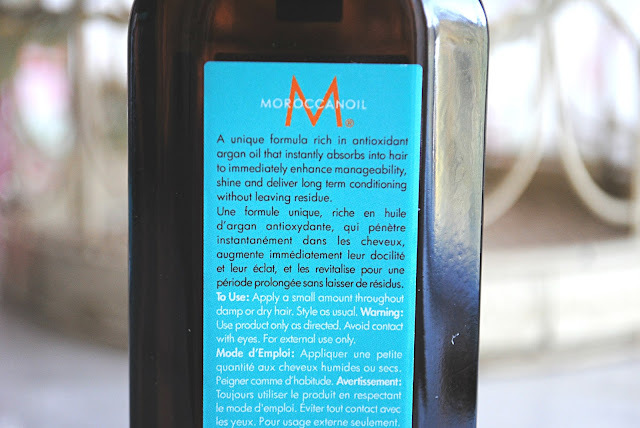 For £30.45 via Fabriah (which is a fab site I only recently discovered), you get yourself a 100ml bottle of Moroccanoil, complete with screw-top lid and a pump, which I thought was a nice little addition (as opposed to just having a pump, easier for travel etc.). The oil smells somewhat similar to the others on the market, although it definitely has a touch of luxury to it, and putting it on my hair is a real treat. For the past few months, I have been using it on the lengths and ends of my towel-dried hair once out of the shower, and occasionally on dry hair if it's been looking a tad frazzled. It makes my unruly hair SO much easier to manage; combing my hair after washing is no longer such a chore, and doesn't take half as long as it used to. Once dry, my hair feels in a much better condition, better than it has in years in fact; seriously soft and smooth. The main reason I love this oil so much, however, is the fact that my hair has grown so much since using it. I always struggle to get my hair to grow past a certain length and I finally feel like I'm getting somewhere with it - looking after my hair more has definitely made an improvement, and I'm pretty sure Moroccanoil has a huge part to play in its sudden growth-spurt. I will also say though, cutting down on washing my hair has also been a great help - less washing and combing and drying means less damage, and it definitely shows. Overall I am so impressed with Moroccanoil and it is most definitely the best hair oil I've ever tried. Is it worth the £30+ price tag? In short, yes. Once my bottle is used up I will certainly be buying another, as I can't get enough of the stuff, and it is a super-duper easy way of looking after my hair, without much effort at all. 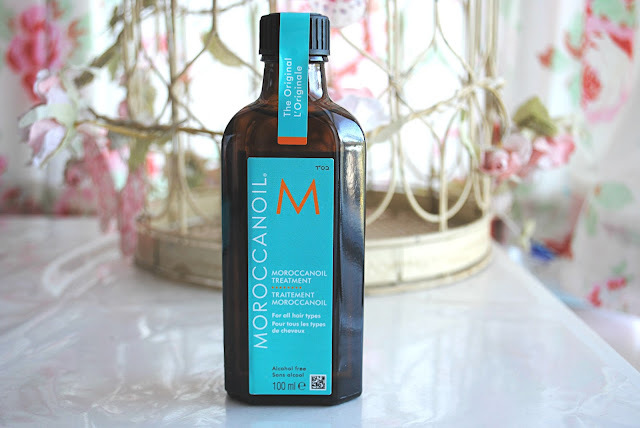 Have you tried Moroccanoil before? What do you think to it?